Last week I traveled to Baltimore to learn more about the new Guinness brewery project unfolding there. Guinness is a sponsor of this blog, and I wanted to be one of the first to delve deeply into the thinking behind the project, its scope, and its goals. Guinness was happy to make this possible, and paid for me to visit. Today we'll get into the brewery project itself, which is breathtaking in its scope. In a couple months, Guinness will unveil their first brewery on US soil in decades (an earlier effort lasted only five years in Long Island City, NY and shuttered in 1954). It marks the start of a big, expensive gamble for the brewery. 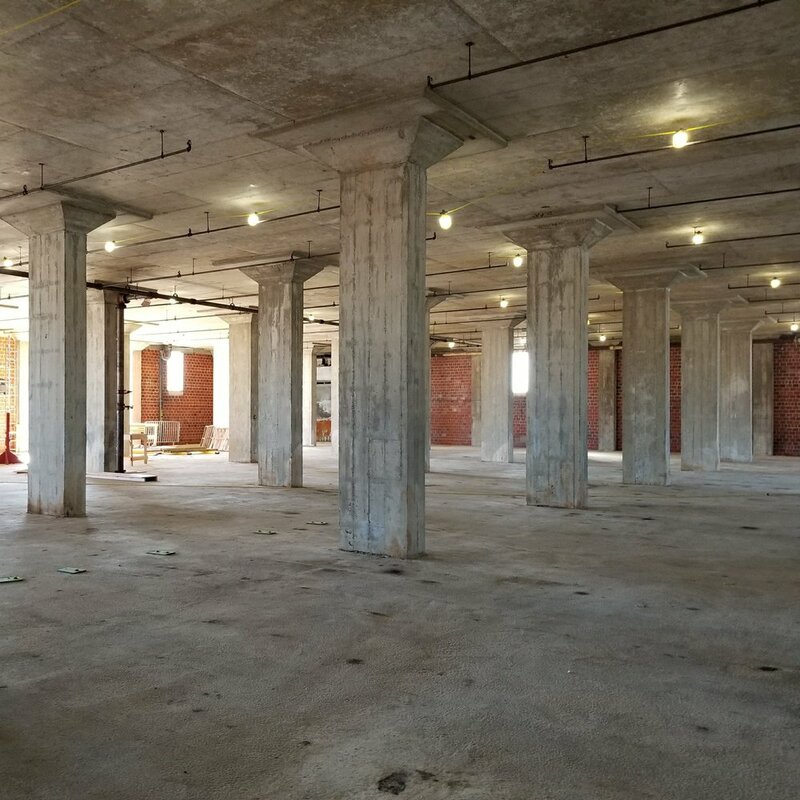 The initiative itself is enormously ambitious, an $80 million project that will include a vast brewpub, recreational grounds, barrel-aging facilities, and two breweries--a 10 barrel and 100-hectoliter kit. But it also represents an effort of the brewery to rebrand itself as something other than a St Patrick's Day tipple. The brewery, associated with Dublin, Ireland, and stout for centuries, is dabbling with a different identity. About fifteen minutes south of downtown as the Lyft glides is a large, grassy site that was the original home to Lord Calvert Whiskey, founded just after Prohibition ended. Scattered around the grounds like college dorms are four- and five-story brick buildings used to house spirits aging in barrels. These are known as "rickhouses" in the trade; the "ricks" are the racks used to stack barrels. Seagram's took ownership of the brand and, in 2001, Diageo took ownership of Seagrams and this site. It stretches for 62 acres, with the rickhouses, office buildings, and out-buildings scattered around; it even has its own power station. The centerpiece of the new facility is a destination brewpub situated in one of those old rickhouses. The company is busy moving earth to create a new roundabout entryway and parking lot, and at the moment it's a giant obstacle course of heavy equipment. Once done--amazingly scheduled for a little more than two months out--the five-story building will have over a thousand seats of capacity spread out over three main areas. The ground floor of the building is where the ten-barrel brewery's located. People will be able to poke around down there, and see through an interpretive glass wall to the brewery beyond. Last fall, Guinness started brewing on a miniature two-barrel system that may or may not stick around. Brewers will use the smaller kit(s) to make one-offs and experimental beer for sale on the 92 taps in the various areas of the pub. The main entrance to the building is accessible via a staircase (the lower floor is partly underground) that leads to a spacious foyer. The guys in Baltimore prized some treasures from St. James Gate, and somehow managed to get half of the kettle from Brewhouse #2, which dates to the 19th century; it will greet visitors as they arrive. This level is given to a sprawling pub built around a central square bar that will have two 20-tap towers and will seat around 300 people. As we were walking around, Oliver Gray, erstwhile blogger and now the company's marketing manager, was making decisions even as he gave me the tour. I've seen a number of construction sites, and plenty of brewery build-outs. I've never seen anything like this. Workers were everywhere. They were on every floor, doing work on the exterior, and of course moving earth: it was like an anthill of activity. The small temporary taproom on site gives a sense of the Guinness aesthetic. The next level up is the restaurant. It will seat 278. The menu will have Irish touches but will tend more in the direction of America and Baltimore. (Though there are overlaps; seafood and especially crab has been a constant theme in Guinness advertising and is also at the center of Baltimore's cuisine.) Amid all the places to drink will be cool displays and artifacts on display. Anyone who has been to the Storehouse in Dublin will have a sense of the aesthetics. Gray mentioned, though, that it will focus more on the beer and brewery and less on the brand and "Guinness mystique" (a concept mentioned frequently in Dublin). Finally, the grounds outside the brewery will feature a large beer garden spilling out of the front of the building and a large, more open area to the side where people can lounge on warmer days. They plan to scatter barrels there, and plant a garden with barley and hops. I'll get to the new direction for Guinness' beer in a separate post, but it's worth mentioning that the brewery offers more than just the 4.2% draft from its traditional line. Guinness only started sending their iconic Foreign Extra Stout (7.5%) to the US in 2010, and I've never seen it on draft--but you can find it served that way in Baltimore. Even more rare--and to my blaspheming palate, better--is Antwerpen Stout (8%), made solely for the Belgian market until just recently. While FES is lip-smacking in its dry, roasty bitterness, Antwerpen is more tangy. Finally, Extra Stout (5.6%) is a beer made for the US market, but still one most drinkers won't know about. These beers illustrate a greater diversity in Guinness' line than most Americans realize. Stouts give the brewers a chance to experiment with barrel aging as well. When I visited, bourbon-aged Antwerpen was on tap, and behind the current taproom (visible through a window) are dozens of other barrels with aging stout. Because Diageo is a drinks company with extensive whisky holdings, the possibilities with their various stout offerings--never mind all the other beers brewers might whip up--make this a nice pairing. These are actually stacked liquor barrels outside one of the rickhouses. When built, the building will serve as a showcase for Guinness, its history and beer. The project can be understood another way, though. Diageo has invested tens of millions of dollars not just on eating and drinking spaces. The company is rethinking the way it makes and sells beer, and this is just the most visible moving part of that machine. Look for future installments when I consider the brewers and brewery, the beer, and the direction of this country as it tries to reintroduce itself as an American craft brewery.